So, On Stage Lighting is now three years old. Finally toilet trained, feeding self and able to stand for significant periods without falling over. But enough about the editorial staff, what’s been going on under the hood at OSL for the first three years of life, and what does the future look like? After a few years of amateur dabbling, making and marketing web sites and, more importantly, making mistakes, I read about ways in which content writers were creating websites, attracting visitors and stimulating conversation while often paying for their work by selling targeted advertising. These professional bloggers often used the free blogging platform WordPress to enable them to set up a professional and easy to administer web property on their own domain. They often choose a niche subject, often a specialism that they could build a brand around, and found both enjoyment and employment in writing online. That interested me and I decided to try an experiment while developing my web marketing skills. It made sense to write about the subject that I had a lot of experience and and a passion for and as a stage lighting professional, the subject choice was obvious. After a fairly quick set up, the first article was published on the 9th July 2007, a brief rundown of considerations when hiring lighting equipment. 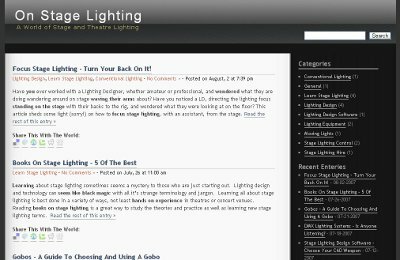 It was simple to follow advice from a professional written for anyone with little stage lighting experience, a template that is still the mark of an On Stage Lighting Article today. Learning from the pros in the blogging world, as a content provider, I do quite a bit of research into what visitors are looking for when they come online. This takes many forms such as the comments sections, a simple poll or question, but also research into what users are searching for, both at the main search engines such as Google, and our internal site searches too (they tell me that many people are trying to find article on “Concert Lighting Techniques” but also “Curtain Tracks”, not something yet covered). Content that is popular in terms of sharing, linking or even the amount of comments (nearly 1000 comments in total so far), also shows areas that stimulate the interest of readers. The main requirement for any On Stage Lighting article is that it is not only informative and enjoyable to read but that the on site Signal/Noise Ratio is favourable. This means that the bar is pretty high for what I consider writing, and why the possibly surprising figure of only 106 published articles makes sense, especially as we try to avoid duplication. Personally, it takes me most of a day to get just a written piece together, much longer for tutorials and that’s excluding time coming up with ideas or the 20+ years of lighting experience behind them. The posting schedule is often dictated by the amount of work it’s taking to make a living in the lighting business (which recently has been a lot) but also on the availability of good content, having something to say. It’s been fairly quiet here at the site in the last few months for reasons that will be revealed further on. But On Stage Lighting has never been about one person and a lot of ideas and advice here is a result of input from other lighting professionals. We’ve been lucky to attract some really high quality guests in Lucas Krech (with a great piece about lighting for dance) and Richard Cadena (about getting to the top in lighting). Publishing a wider range of writers at On Stage Lighting is something that I’ve been working toward for quite a while, whether it be big names or readers with new experiences, and it’s definitely something we are keen to encourage. Over the last three years, On Stage Lighting has published a range of articles from how-tos such as Lighting An Orchestra, introductions to RDM DMX and Media Servers plus practical guides on fault finding, PAR Lamps or focussing like a pro. There has also been plenty of information on working in the entertainment business and the state of the industry, something that our large number of undergraduate readers have found useful. Some pieces have turned out to be faintly amusing, particularly the Guide to Lampie Slang, and on occasion a little ranty, Dr Mr Speaker…, a piece on the importance of visibility based on years of bitter experience. We even got a glimpse into the world of teenager Josh and his first experience on the lighting crew at Glastonbury Festival. In September 2010, I am hoping to be able to continue the tradition of the PLASA London reports as in 2007, 2008 and 2009, getting around the halls and avoiding the press release police while picking up the real buzz from those in the industry. Some readers like the technical tutorials (yes, I know, MagicQ Moving Light Tutorial, still stuck in the pipes), others the more abstract concepts in pieces such as Concert Lighting Programming in 30 Mins. My personal favourites sometimes stem from my own enjoyment of thinking about the subject, such as new ideas in Fixture Personality Files. The geeky part, let’s have a nose backstage at some site stats. Getting up to 20,000 unique visitors per month from over 120 countries worldwide, an average reader looks at 2.2 pages per visit. That’s good engagement by today’s online standards as much of the time, visitors are looking for one specific thing, not to browse the entire site at their leisure. This is particularly good as over 80% of On Stage Lighting visitors come from a search engine (search visitors are not always the most engaged on the planet) and 74% are what we deem to be new visits, rather than returning ones. So, in a nutshell, the site must be doing something that people are finding attractive when they arrive. The core readership, and the most important to us, is the regulars. Those include the 1000+ RSS or email subscribers (40% email, still a popular way to recieve the latest article), plus those on social networks like Facebook and Twitter, where links to new stuff are published. It’s the core readership that I take most interest in because their needs are most aligned with what we are trying to do. I know that it’s is often the same readers that I am in contact with personally via social networks or email and who often inadvertantly give me ideas for new articles. All these visitors come from somewhere. Apart from search engines, On Stage Lighting has a number of regularly referring sites, Facebook being the biggest. Many of the Facebook referrals are not connected to either my own FB profile or the OSL Facebook Group, suggesting that these social networks really do promote sharing of ideas and content on the outside. Other big referrers are Wikipedia (aaah, one day a Wikipedia editor will write an entry for On Stage Lighting….) and the Blue Room Technical Forums plus the popular US lighting industry blog iSquint.net. All these visitors find what they are looking for, not only in terms of content here, but also in our range of advertisers, sponsors and affiliate merchants. Some visitors that see the value in so much free lighting help donate direct to On Stage Lighting and this, combined with the advertiser revenue keep not only the servers paid up, designs done but also enable development and writing to continue on the site. OK, so I said that there was exciting news. It’s personally good news for me but also for On Stage Lighting. Earlier this year I came off the road, after 15 years as a freelance lighting professional, to explore possibilities for me in the education of the next generation of technicians. Richard Cadena recently told us that everyone in our business under the age of 30 is trying to work out how to get in, while those over 30 are wondering if it’s ever possible to get out. Well, I just turned 35, I dunno what to tell ya…. Anyway, although a bit of a risk, things worked out particularly well for me as I managed to secure a new post as a Lecturer in Theatre Production at Bath Spa University which starts in September this year. This is obviously a great opportunity for me to progress on my new path doing something that I love – helping others interested in our business. I might also add that On Stage Lighting as a body of work played no small part in securing that gig. The reason that this new role is good for On Stage Lighting is that it will enable me to spend more spare time writing and creating, and less time loading trucks at 0300 and generally living life on the edge as a freelancer. Working with students day to day will give me more ideas, create more content and generally improve on the last 3 years of work while maintaining On Stage Lighting as a free resource for current readers and future ones. I will also have the opportunity to research new things and continue my own learning while maintaining my links with the professional lighting world. The thing that writing has given me is the opportunity to think about the subject, something that is not often the case when you are stacking Martin cases in the back of a forty five footer at silly o’clock in the morning. Trying to interpret for others that which you know by instinct is a great way to a better understanding of your subject. 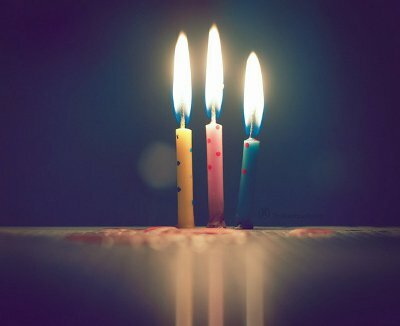 So, Happy Birthday everyone. On Stage Lighting is a product of everyone here, readers and contributors alike so buy yerself a drink (or see if you can spot me at PLASA London this year and remind me that I owe you one). PS. Though On Stage Lighting is unlikely to receive any birthday cards, you can celebrate the occasion by writing something really nice about the site in the comments section, tell us about your favourite stuff so far or how we’ve helped you. I bought you a birthday beer 🙂 congratulations and thank you for three years. I’ve said it before but I really appreciate the time taken to inform and inspire your readers. Happy birthday to you, squashed tomatoes and stew, bread n butter in the gutter…. Many belated happy returns. Love the site (interesting glimpse behind the scenes here), and thanks again for the advice earlier in the year about taking on my new role. Turns out you were right; it is just like leading any other team and we’re now slowly finding our feet together. Good luck for the future, sounds very exciting! Congratulations Rob and On Stage Lighting! You have created an especially valuable service to the lighting community and we are all richer (perhaps not monetarily but in every other way) for the experience. May you find even more success in the future. And good luck with the new teaching position. You will certainly learn much more, as I have from teaching classes, than you ever thought possible. Please share your experiences with us all. A great site, obviously with many hours of work put into it. Have had the pleasure of reading many of the articles. The articles have filled a void (of technical information) that appears to exist here in Australia. Well done, and best of luck for the future. Happy Birthday to a great thing. Really good article, as an electrician im quite a fan of stage lighting.